The Avalon Condo Hotel has now sold 16 of the 34 available units. The demand for this property has been staggering with new reservations being filled daily. Price increases will be coming soon. Contact us at info@luxuryfractionalguide.com soon if you are looking to purchase a condo hotel at Avalon. 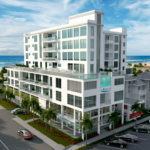 The 34-unit Avalon will soon be built on the north end of Clearwater Beach just steps from the sand. The boutique property will be a well-appointed condominium that you can live in year-round or have rented nightly as a high occupancy beachfront hotel with large exquisitely designed resort residences. For those who desire a tranquil beachfront location; one that is near shopping, dining and entertainment options, the Avalon is the ideal choice. The Avalon offers a two-year seller leaseback program, which will provide up to an 8% net income for these units. These figures are after all expenses, including real estate taxes, making this a very attractive, true net return. The project will begin construction this coming summer with completion expected in early 2021. One-, two- and three-bedroom floor plans are available, starting at about $600,000, but the first price increase will happen soon, so if you are interested in learning more, do not delay – contact Joel Greene at Condo Hotel Center or call Joel at (954) 299-3801.